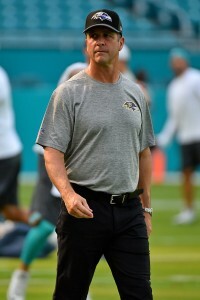 The Dolphins are mulling a trade for Ravens coach John Harbaugh, a league source tells Mike Florio of Pro Football Talk. However, the source adds that the Dolphins will only call the Ravens if they know in advance that the asking price will not be too high. Some in league circles believe the Ravens will ask for two first-round picks, Florio hears. Others think the asking price will be lower, though a trade would still presumably still require a forfeiture of draft capital. Florio speculates that the Dolphins’ move to reassign Mike Tannenbaum and install Chris Grier as the top football operations guy may have been done to attract Harbaugh to Miami. At minimum, it’s a structure that could hold appeal for the 56-year-old coach since Grier has a reputation for putting ego aside and acting in the best interests of the team. The Broncos could possibly have interest in swinging a trade for Harbaugh as well, but for now, Harbaugh’s focus will be on the field. His Ravens will face the Chargers on Sunday in a Wild Card showdown. How about trading for Mike Tomlin instead? We’ll throw in his copy of “An Idiot’s Guide to Being a NFL Head Coach”. It’s pretty much mint condition. To be fair he does have more rings than me and you combined. Oh well Ironman if he has more rings than you and everyone here than you think that means anything? Get real. If a team wants to trade for a coach can they only acquire him using picks or can players be involved as well. Trading for a coach is absurd & especially at the cost they are discussing. Using even 1st round pick hurts the team. Historically teams that have traded 1st picks have come out on the short end of the trade. Lions traded 1st round pick for Pat Swilling, he sucked , Lions pick was used by NO to draft All Star Willie Roaf. If Baltimore gets anyone to trade high draft choices for their coach, they will come out significantly ahead. It should also be noted that no SB winning coach has ever duplicated the achievement with a different team. Didn’t the Raiders trade with the Bucs for Gruden once?